Which way on the slide? 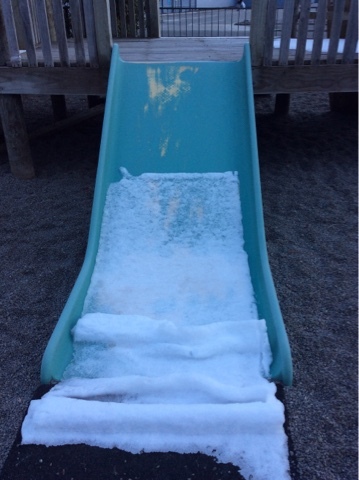 This morning a group of children were having trouble deciding which way to go on the slide, up or down? 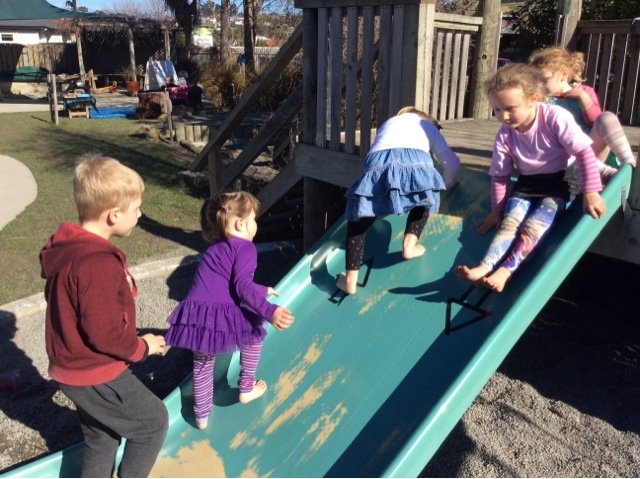 Some children shared "Lets go down" while their friends quickly replied "No Climb up." 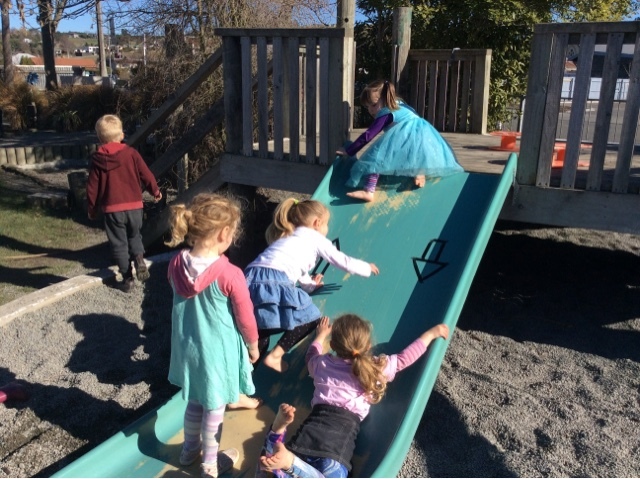 After some negotiating and problem solving we decided that if we were careful we could climb up one side and slide down the other at the same time, but how could we remember what side was what? Luckily, this had been explored the week before and I and put some masking tap in my bag to use on the slide. 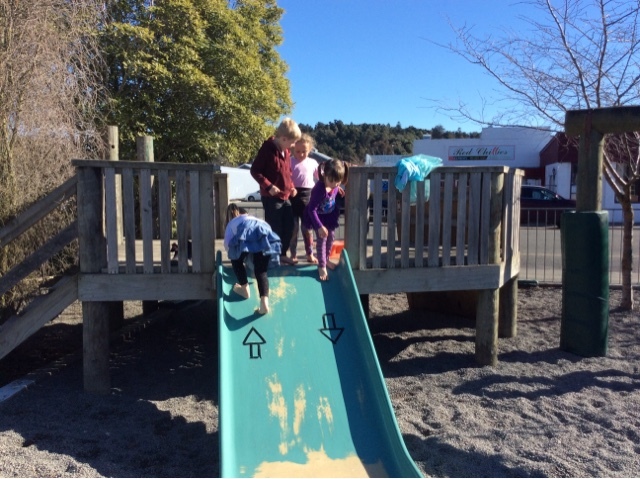 So we decided creating arrows on the slide would help us remember and also show manaakitanga/ care and respect for the other children around us. So we worked together to create an arrow first we made a "rectangle" and then joined a "triangle" onto that so that it makes and "pointed shape" Emma shared as we talked about creating an arrow. The play then continued with the children exploring what the arrows ment, and sharing their knowledge with the other children around them. They often applied past knowledge of what happened when they had early slid down the slide when a friend was climbing up sharing "We crashed." 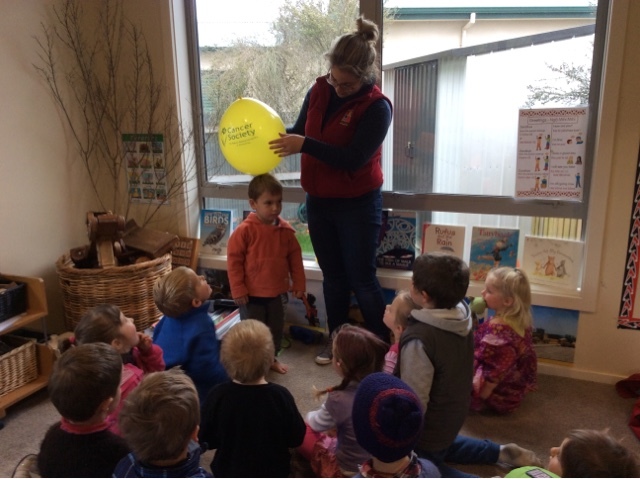 Ashleigh read a wonderful story about a balloon to the lunch time group of children and just by chance after a visit to the supermarket we brought back some balloons. Could we make the same balloon shapes that the picture portrayed? Not really but we did come up with a few ideas like rubbing the balloon on our hair! 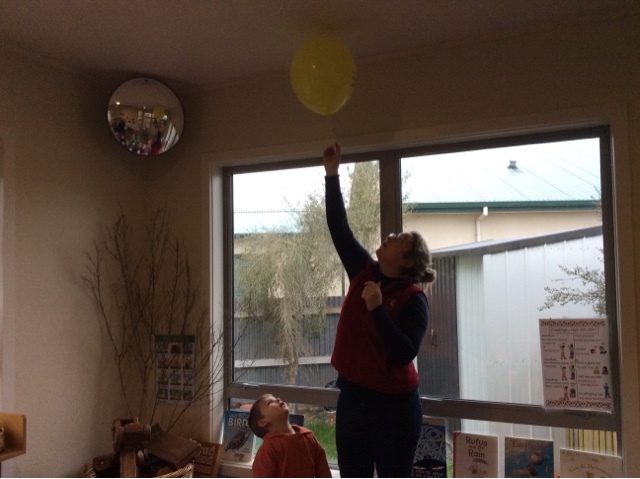 The children didn't notice Beau's hair rise up with the balloon but squealed with delight when the balloon reached the ceiling. It floated back down again to try something new. The children suggested to make it into a sausage and then we could sit on it. 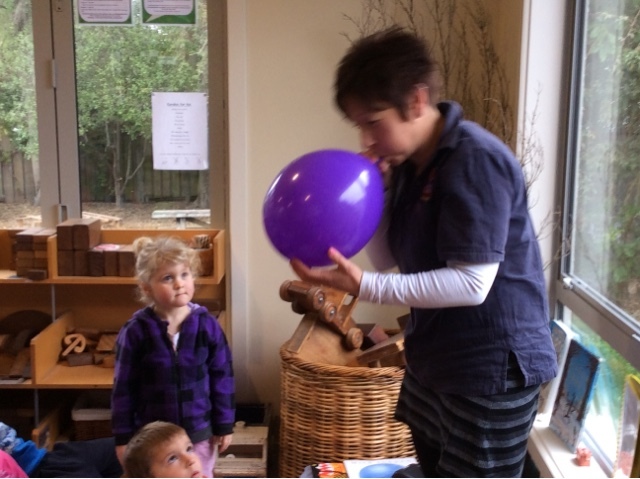 Incredibly, Sarah took upon herself to please her audience and sat on the yellow balloon! It went pop! Out came another balloon and Sarah puffed and puffed and waited and waited. She let it go! 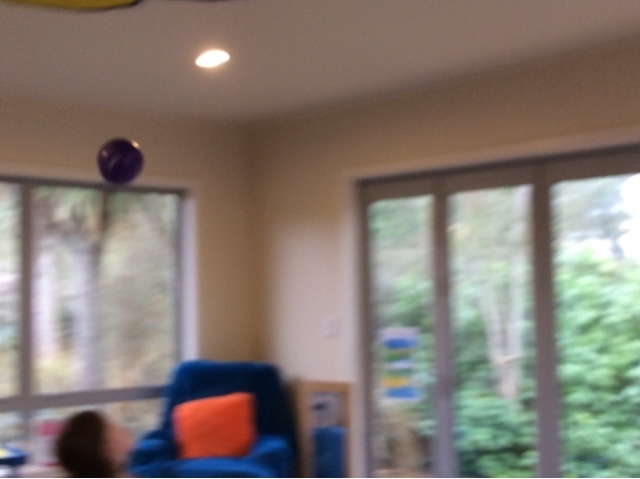 The balloon flew across the room and that was the end of that! It's fun when we all laugh to together and it set the scene for lots of chatter at lunch time too. We have been fortunate to have received a large construction pieces of Aoteoroa. By placing them on the mat it was so awesome to see how the children interacted with them. 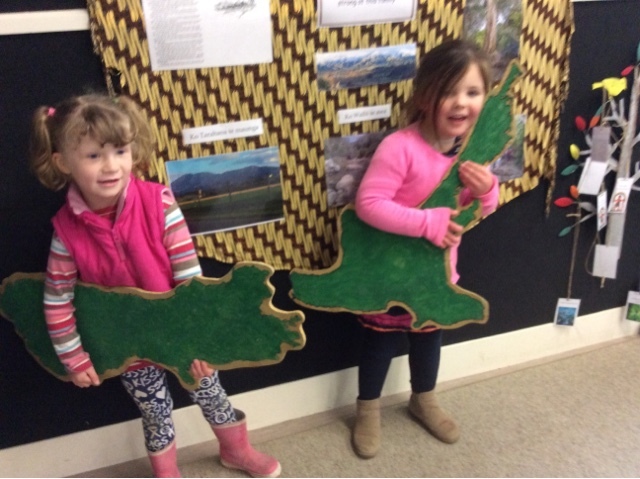 They knew they were the shapes of where we live and confident to point and lie on top of the South Island, Te Waipounmau to show us. 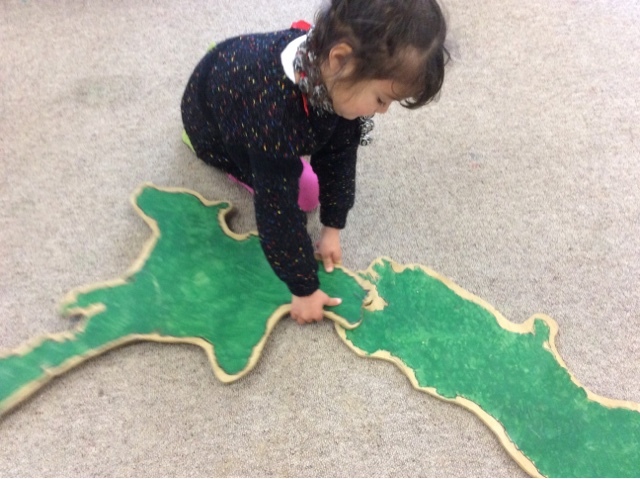 However, we love how the children can think so creatively and seeing Chania interlocking the islands together and trying different ways by lifting it up to make the pieces fit was so ingenious. And later in the morning they became the guitars for Macy and Alice to have a sing a long together. 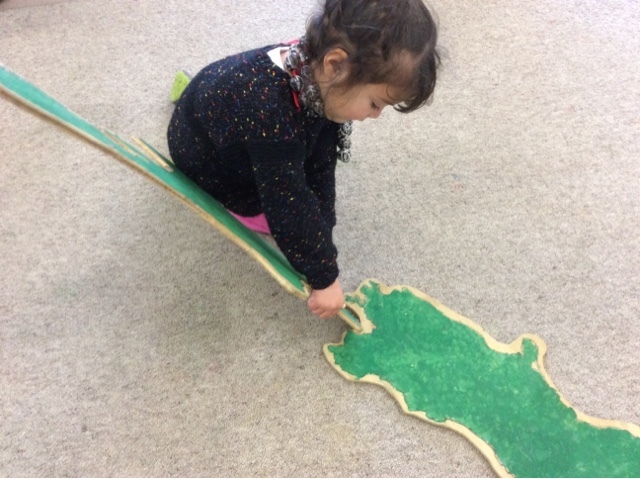 Ka mau te wehi - That’s amazing! Kei te pai! 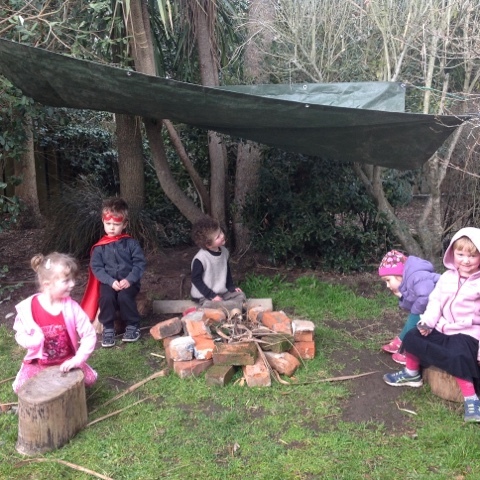 Today a group of children were enjoying exploring out the back (our natural play area) when they came across the camp fire that a group of children had created a couple of weeks ago. 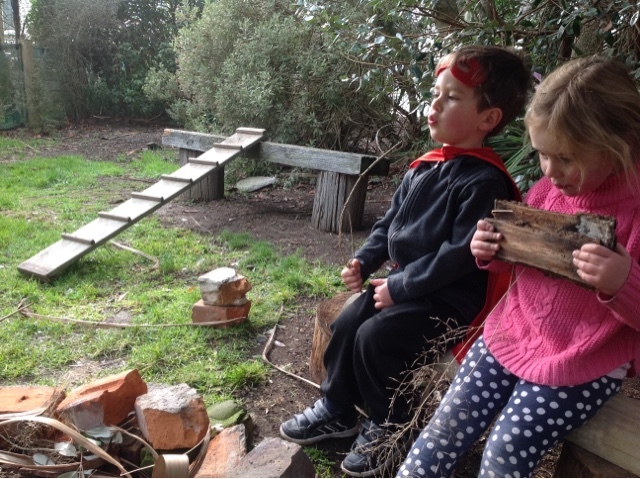 Jack, shared with us..... "I really need to make a campsite"
Hmmmmm so we wondered how we could do this? Some resources were gathered and a tarp and some bungee cords were used to create a tent/roof/campsite. Problem solving was required as everyone worked together to get the roof up and the best way agle the bungee cords so it would stay up. Surprisingly it was quite an easy task to get the roof to stay up and it was now time to enjoyed the new campsite. "We need the seats underneath the roof" Jack said. So with some more team work and perseverance stumps were moved under the roof and planks placed onto to make some seating reading for toasting marshmallows. 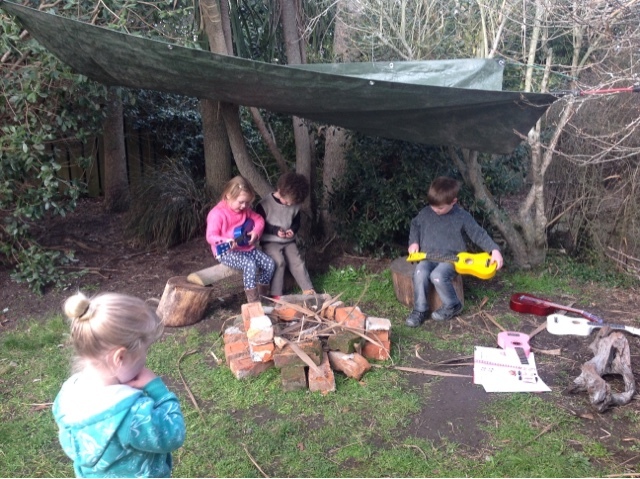 As the morning went by groups of children came and went from the campsit where singing and playing the ukuleles around the campfire was enjoyed! 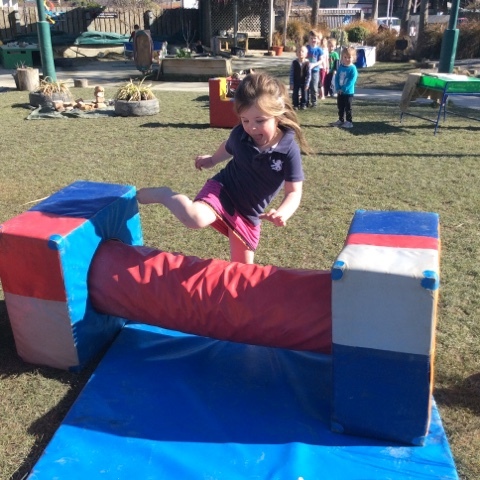 We are starting to have some lovely warm weather and this afternoon the children set up a high jump like obstacle. The large group of children lined showed their excitment as they waited in line for a turn while everyone took their time to make the first jump over. 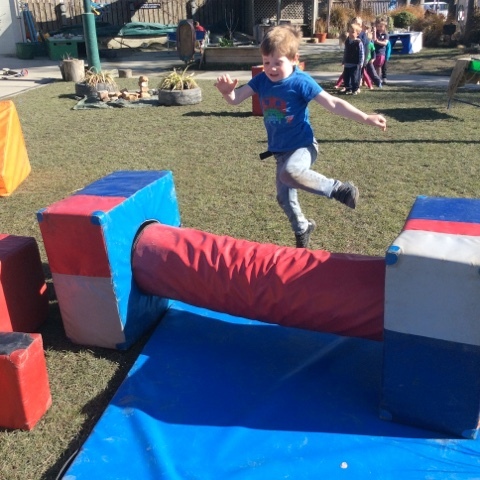 Everyone had different techniques that they used to make their way over the jump, some stepping over with one leg followed by the other or some even using a run up to pick up speed and jump right over the top. Āe mārika - How about that! 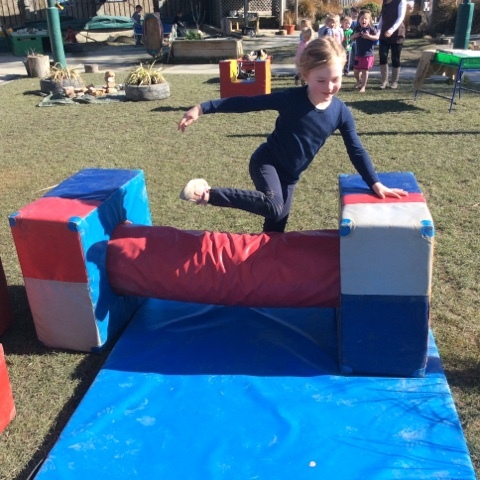 A real indication of the thought and intention that was behind everyones attempts to get over the jump, some succeeding the first time and others enjoying the work involved to persevere and get better each time they made a jump. 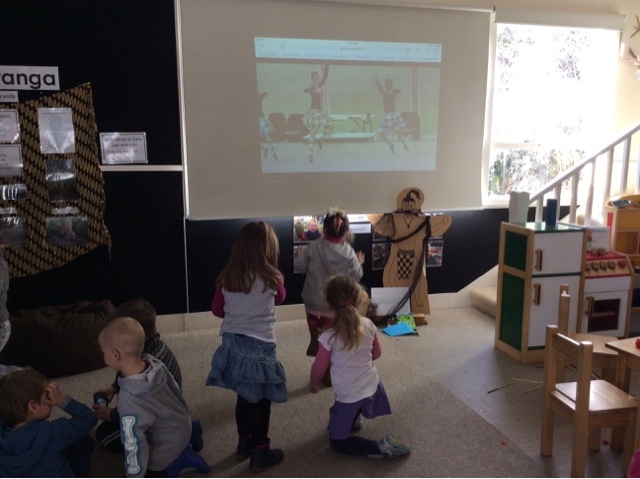 Children showed Manaakitanga/care and respect as they lined up waiting for a turn but also as they gave each other encouragement! "Good job Rubie" Hugo shared and "That was a good one too Macy" who jumped over afterwards. 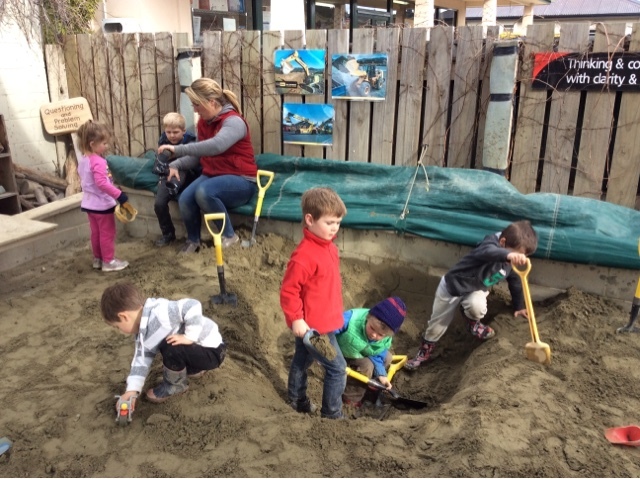 The sandpit was a very busy space this afternoon as the tamariki decided to dig to the North Pole! Working interdependently is a great Habit of Mind to develop and big group activities like this definitely encourage this skill. 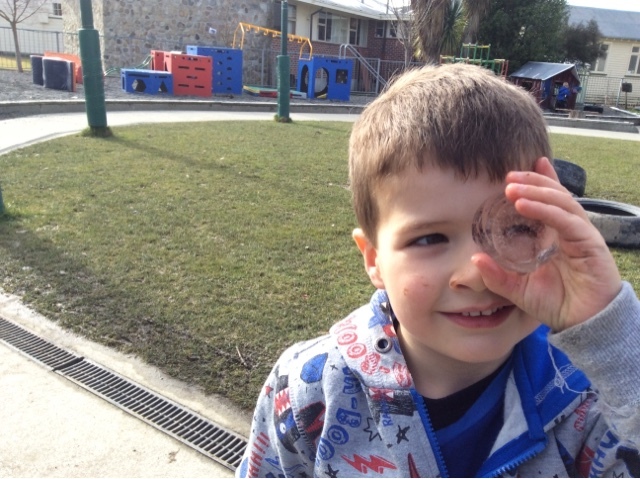 As the tamariki worked, some exciting taonga/ treasure was discovered. A hippopotamus and a spade. 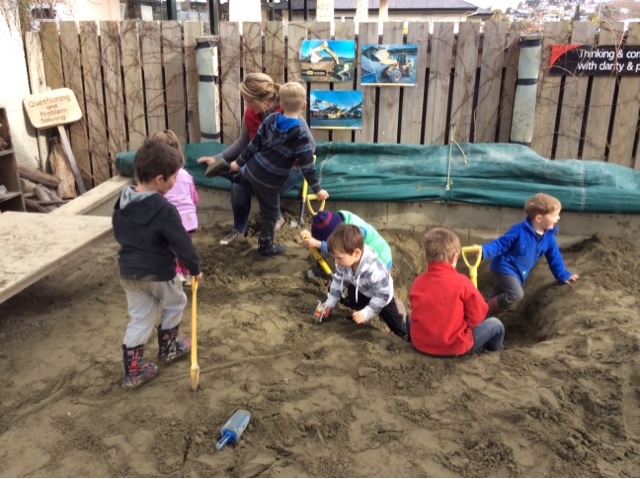 We don't know how long they had been hidden in the sandpit for! Then the tamariki composed a song. Ashleigh had been talking about rhyming words and what rhymes with hole...this is the song we could hear from the sandpit. The children decided they might even find Santa Claus there. Āe mārika! How about that! Such an industrious afternoon, with much fun, discovery and learning. With great excitement children returned to kindergarten after an unexpected long weekend with kindergarten closing on Friday due to the snow. Sharing stories of how they had all spent the day was a fun way to make connections with friends. 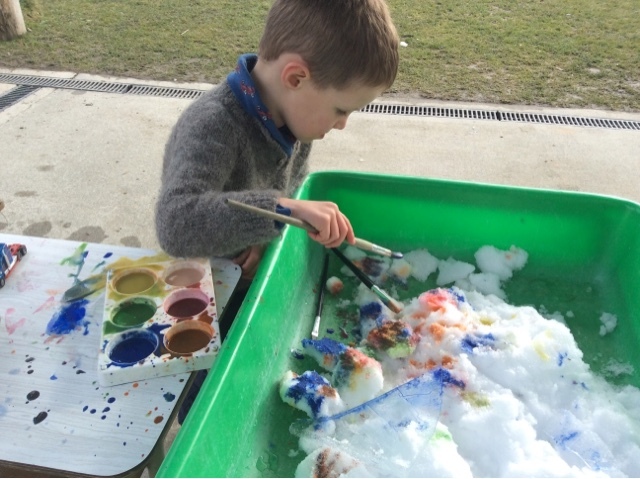 Exploring children's working theories around their concept of snow was also interesting. 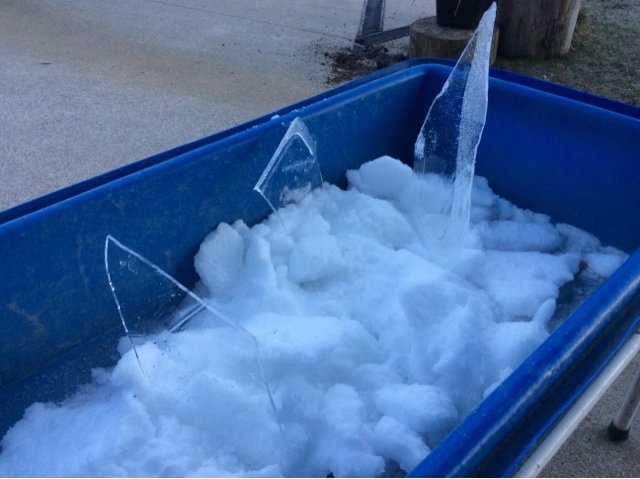 As I put a child on the mini bus on Thursday I explained " Tomorrow it may snow" and having recently shifted from Auckland, he naturally asked " What's snow? " What an incredible first hand experience lay waiting to be discovered the next morning at his house. So today the environment still encouraged a revisit and wonderment and awe as snow still lay around in places and a little extra had been added to explore in a different way.It is winter ,tona hotoke, it is very cold , he tino makariri ! 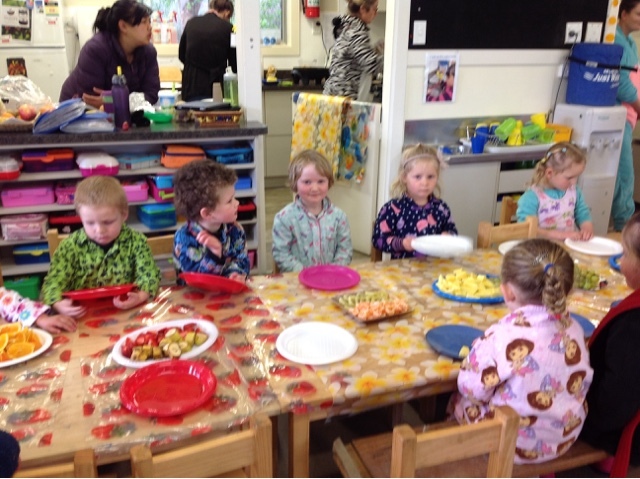 After much planning and antipation today was the day to wear pyjamas to Kindergarten for a pyjama party. 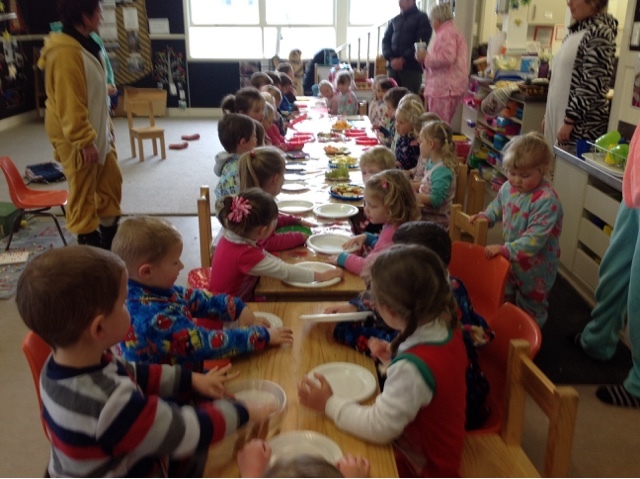 The children arrived wearing all sorts of pyjamas and excited faces. 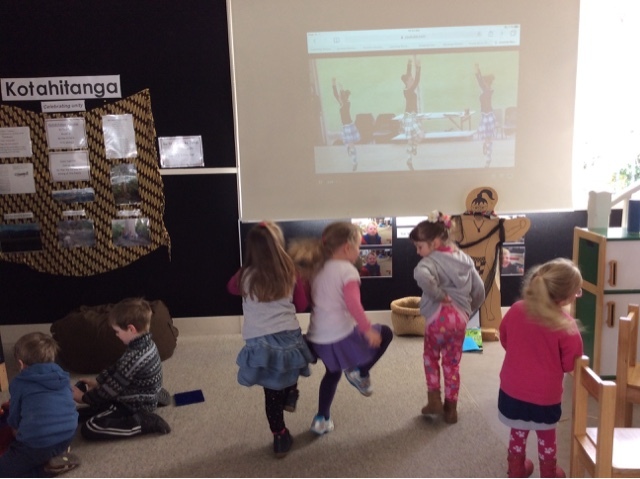 At Kotahitanga time we were able to look around the circle and see what all our friends PJ's looked like and out of everybody only two children had the same PJ's on! 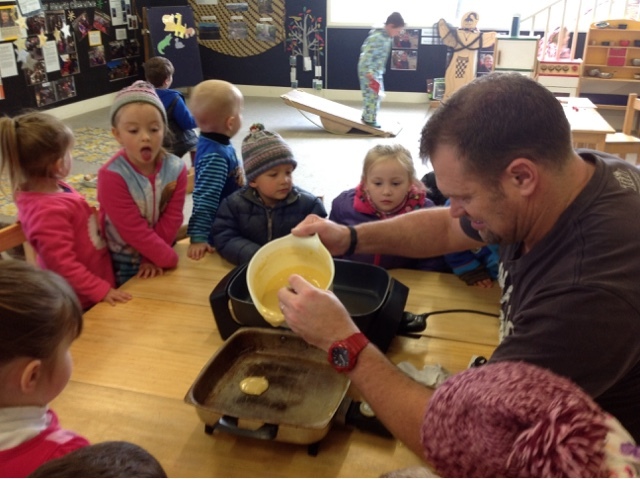 Then it was time to work together and share our ideas around pancake making, luckily we had an expert on hand (Gavin) to extend our knowledge. We needed to listen carefully to keep ourselves safe while the hot fry pans were on but wow it was so cool to watch the mixture turn from liquid to solid, great scientific exploration. Soon the pancakes were cooked and we set up the tables for our shared morning tea of fruit, yogurt and pancakes. We gathered together for karakai then found a space at the long, long table. We needed to manage our impulsivity and practise manaakitanga as we waited for all our friends to sit at the table before we began our feast. Then it was time to enjoy our morning tea together, there was discussion, laughter and fun had by all as we enjoyed the delicious Kai. What an awesome day it's such a wonderful experience to share special times with our friends. Today a small group of girls came up and asked... "Can we please do some highland dancing"? 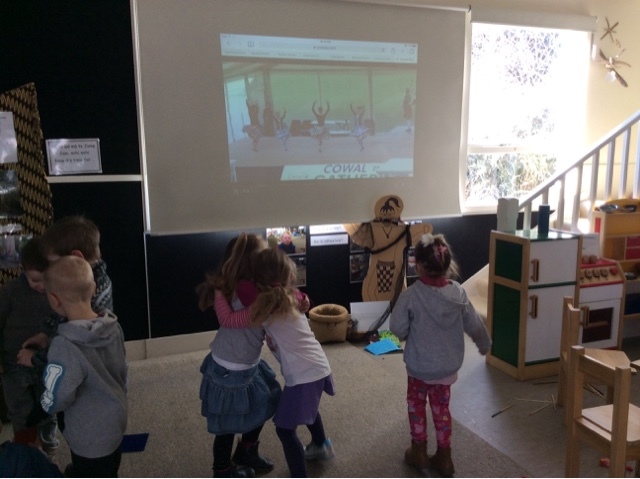 It was a really cold morning so the dancing was a great idea to help us warm up. We sorted out the projecter and connected up the iPad - exploring technological awareness to follow through on the plan. Soon we were ready to go. 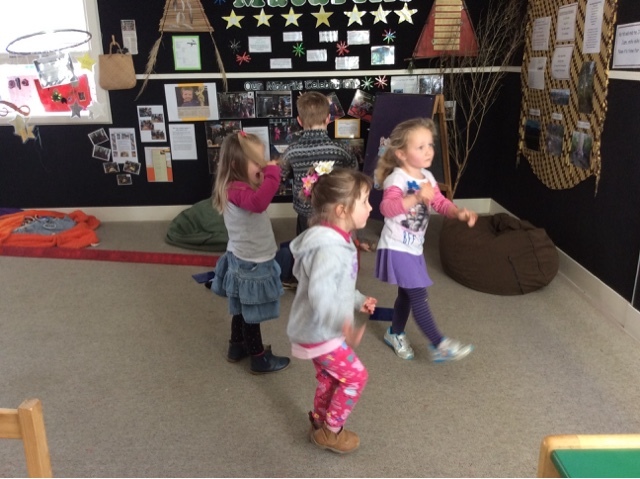 The music started and it was time to practise our steps this took concentration, persistence and co-ordination. He pai to kanikani - great dancing! As the girls danced small groups of children were drawn in by the music to watch and be part of the experience. As the dancing continued a variety of children came and took a risk to give it a go. 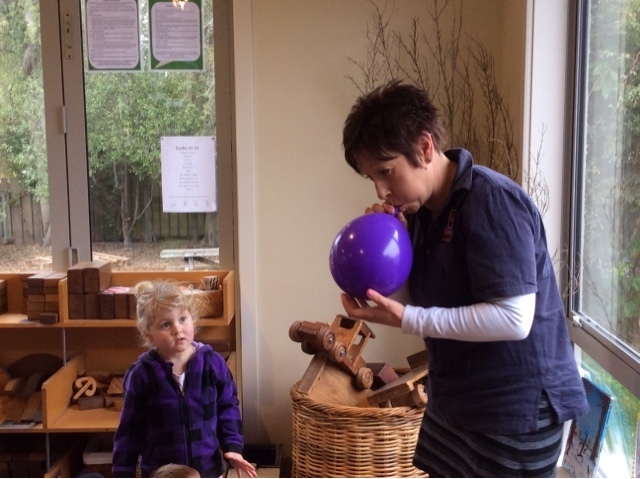 Being involved in musical experiences provides our children with the opportunity to discover and develop different ways to be creative and expressive. What a great idea girls it's so fun to exercise our bodies in such a fun way. Highland dancing takes precision and practise I look forward to learning more about the steps with you.